The "Adriatic Atlas to support ICZM and MSP" is the first Web Atlas for the Adriatic Sea that was developed, within the Shape project, through a cross-border approach (involving Italy, Slovenia, Croatia, Montenegro and Albania). The Adriatic Atlas is designed as a tool for storing, visualizing and managing data which are necessary for the implementation of Maritime Spatial Planning (MSP) and Integrated Coastal Zone Management (ICZM) policies in the Adriatic basin and through a cross-border cooperation approach. It represents a first support to the decision-making process, in which all the information has been harmonized at the basin level. The Atlas includes a wide range of spatial data (layers) organised in topic categories according to INSPIRE Directive. Recently the EU funded HAZADR fed the atlas with new spatial data on coastal vulnerability to technological risks. Moreover, Shape Atlas contributes in feeding the Adriplan Data Portal, developed by the ADRIPLAN project. What are the most relevant spatial data to be considered at macro-regional scale (i.e. Adriatic Sea) to support MSP and ICZM implementation? How MSP and ICZM relevant spatial data can be efficiently managed and shared among users and with other web data tools and platforms? The Adriatic Atlas was developed within the project SHAPE “Shaping an Holistic Approach to Protect the Adriatic Environment between coast and sea” (http://www.shape-ipaproject.eu/), co-funded by the IPA Adriatic CBC Programme. SHAPE aimed at developing a multilevel and cross-sector governance system for MSP and ICZM in the Adriatic Sea, based on a holistic approach and integrated management of the natural resources, risk prevention and resolution of conflicts among uses and users of the Adriatic coast and sea. The Adriatic Sea represents an important marine area of Europe, both from its socio-economic relevance and environmental values. It stands for several interests and economic and social interactions exercised by the neighbouring Countries and Regions. The Adriatic is also a basin where multiple pressures linked to the exploitation of natural resources and to human activities affect coastal and marine ecosystems; their sustainable management require the adoption of a cross-border and synergic approach among all the countries. For this reason the SHAPE project recognises the remarkable importance of deepening and strengthening the economic, social and environmental knowledge about the Adriatic basin, starting from an extensive gathering and efficient organisation of existing spatial data, that led to the creation of the Adriatic Atlas supporting ICZM and MSP. 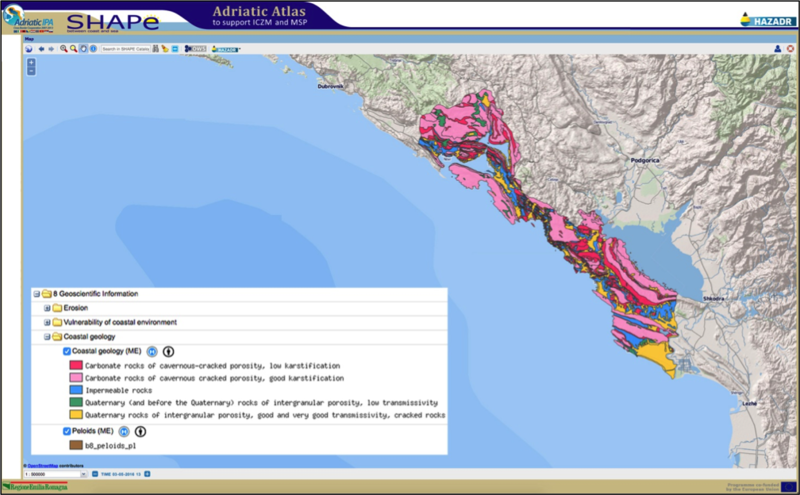 The Adriatic Atlas was designed as a web-based tool for storing, visualizing and managing spatial data deemed necessary to implement MSP and ICZM in the Adriatic Sea, in particular in a cross-border perspective. It wishes to represent a first tool supporting the decision-making and planning process, in which the available information has been harmonized at the basin level, according to the INSPIRE Directive requirements. The atlas was also designed in order to allow the visualisation and sharing of data at the local and/or regional scale, i.e. the specific scale of interest of each SHAPE partner. Moreover, the Atlas intends to represent a starting point for other future projects in the area that might benefit from the wide range of data which have been collected in the Atlas, thus facilitating spatial analysis on marine and maritime related issues. At the same time, the Atlas is designed to easily incorporate useful spatial data that might be generated by other projects and initiatives. Identification of main potential users of the Adriatic Atlas and analysis of user demands, in terms of data and functionalities needed to support ICZM and MSP implementation. Mapping of data availability among SHAPE partners and within sources external to the SHAPE project. Elaboration of a procedure for data collection and metadata creation. Design and implementation of the web-based Atlas, including testing and debugging. Promotion of the Atlas among partners and dissemination to external users. Services for data distribution are guaranteed in line with OGC standard, i.e. the Web Map Service (WMS) and the Web Feature Service (WFS). A Creative Commons (CC) license is applied to most of the data; i.e. a public copyright license that enables the free distribution of a work copyrighted otherwise. In particular, the types of licenses applied are CC-BY-4 (data can be used if users give the author and/or source the required credits), CC-BY-SA (data can be used under a license identical to the license that governs the original source) or CC-BY-NC (data can be used only for non-commercial purposes). The data within the Atlas are structured to be INSPIRE compliant and are linked to metadata, developed according to EN ISO 19115 provisions. Utilities and communication, including: pipelines and cables, dumping sites, sewerage and discharges. A number of data refer to the whole Adriatic scale, while other data are visible only at the sub-regional scale, either because the related items assume relevance only at this scale or due to data availability constrains. The Atlas is a dynamic tool that is maintained alive by the Emilia Romagna Region. Recently the HAZADR project co-funded by the IPA Adriatic CBC Programme, fed the atlas with new spatial data and tools on coastal vulnerability, in particular to oil spills. As the Atlas is compliant with OGC standards its spatial data can be shared with other on-line tools and platforms. For example the Atlas contributes in feeding the ADRIPLAN Data Portal (data.adriplan.eu) developed within the ADRIPLAN project and focusing on the wider Adriatic-Ionian macro-region. Moreover, the SHAPE Atlas is linked to the European Atlas of the Sea. Costs: not possible to be defined, as part of the overall funds to the SHAPE project. A core group of 4-5 persons worked on the design and creation of the Atlas, while an extended group of SHAPE partners was involved in collecting, processing and providing data to the system manager. Funding Source: the Atlas was developed within the SHAPE project, co-funded by the EU through the IPA Adriatic CBC Programme 2007-2013.